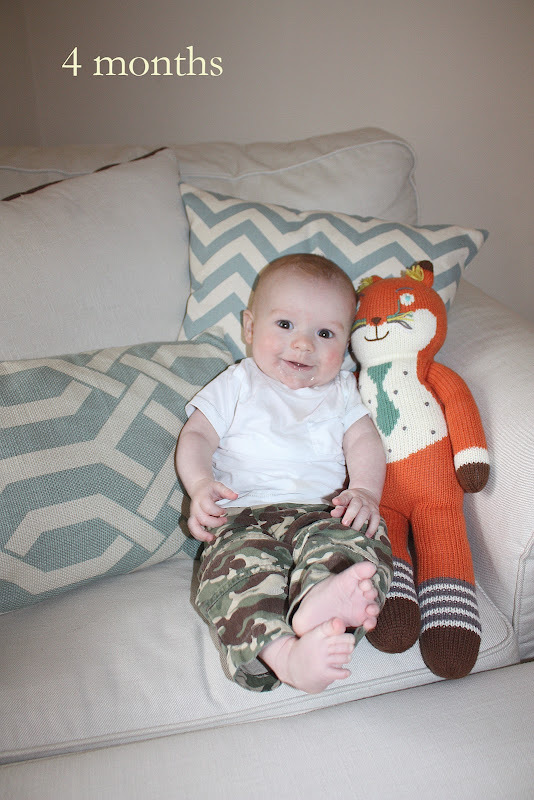 McLendon McBlog: Little Man is FOUR Months! Paddy Boy! You are FOUR months old. I can't get enough of you sweet boy. Watching you grow is a most amazing experience. Every day you discover something new. You are trying new things... like sitting up. But usually something like this happens. Plop. ... or this. Forward plop. Right now you are experiencing lots of firsts. Some of theme great, some not so much. But that is just how life will go. Hopefully the good always outweighs the bad and great things are sprinkled in with the good! Slept through the night: On May 11, 2012, you slept for more than 8 hours straight. Sadly, it was a very short lived first. After a week or two of blissful sleeping, you learned how to roll (!) and now you practice this new skill every night. All night. You're up. All night. It doesn't leave much time for sleeping. Hopefully you will start sleeping more soon! First laugh: On April 18, 2011, I was holding you and Daddy tickled your cheek. It made you giggle. This was technically last month, but this past month you have been laughing much more... usually at your sister's daily ballyhoo. First roll (front to back): On May 10, 2011 you rolled front to back, pretty much by accident, aided by the force of gravity. First roll (back to front): On May 23, 2011 you rolled from back to front on your playmat in the living room. You have completely mastered this now and you refuse to stay on your back now. First illness: You cought your first cold on May 28, 2012. You are SO tough and are already feeling much better. First slept through the night on your tummy: May 24, 2012. Completely against your mother's will. It gives me fits that you roll onto your tummy and insist sleeping that way. WOW, we are so proud of all these big firsts, little man! You are my sweet little guy and I cherish all the moments I get you all to myself. My arms feel empty when I am not carrying you around the house and holding you on my lap. We are so in love with our Paddy Boy! Aren't little boys SO much fun!!! He is adorable, Meryl!!! you all make such beautiful babies!!! and your pics...are.awesome!! they always look so bright! Happy 4 months to Paddy!!! he's a cutie!! !